Remember when we reported about the possibility that Intel could launch its Glacier Falls CPUs next year? Well, it appears that the semiconductor maker had released something far earlier than expected, but instead of HEDT CPUs, Intel has chosen instead to quietly release its new B365 chipset into the market. The new mid-range chipset falls in between the current B360 and H270 chipset. Despite its moniker though, the new chipset is believed to resemble the Intel’s Kaby Lake H270 chipset more in terms of features. However, instead of being built on Intel more current 14nm fabrication, the company has – oddly enough – decided to build its new chipset based on a larger 22nm die lithography. But that said, the B365 chipset does certainly feature several upgrades over the B360. Specs-wise, it has 20 PCIe 3.0 lanes, versus the B360’s 12. 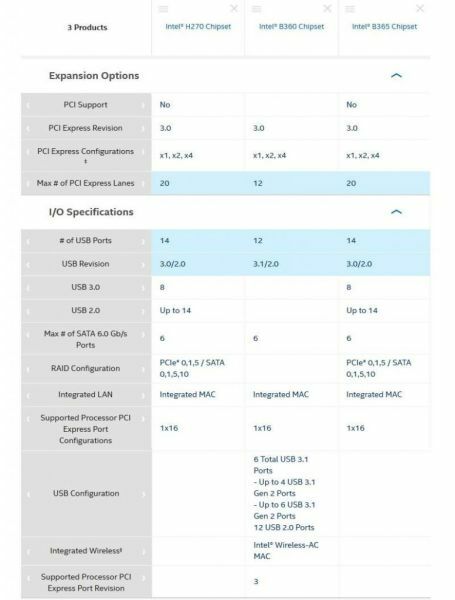 It also comes with 14 USB ports in total, and even includes hardware RAID for PCIe and SATA storage support.Sadly, the B365 chipset doesn’t seem to come with USB 3.1 Gen2 support, neither does it get integrated Wireless-AC MAC. Leaving it Intel’s AiB partners to implement such features on to the motherboards themselves.